The altcoin market hugely rose in popularity during 2017. The largest altcoin by market capitalisation for most of 2018, Ethereum, rose from around $8 at the start of the year to above $1400 at one point. Massive market movements attracted traders and investors to place more and more positions in altcoins in hopes of massive profits. The altcoin market is vastly different than Bitcoin. New projects arise every day. CoinMarketCap currently provides data on over 2000 projects. Many of these projects will not be around in the future and a lot have extremely low levels of liquidity. Picking the right altcoin exchanges is essential when trading in the altcoin market. With altcoins already having lower market caps than Bitcoin, users should avoid picking an exchange with scarce order books that may be subject to flash crashes or periods of low liquidity. Oftentimes, users want to invest in a certain project but only a small number of exchanges will list it. We cover the exchanges with the best operations and liquidity, and also the exchanges where you will likely find the altcoin that you wish to invest in. We include exchanges where you can speculate on altcoins with fiat currencies and also via crypto-to-crypto trading. This list takes into account the tools provided, liquidity, security, and more. Binance is the largest cryptocurrency exchange by trading volume and lists many of the leading altcoin projects. Cryptocurrencies can be traded against USDT (a stablecoin which is pegged to the USD), Bitcoin, Ethereum, and BNB (Binance’s own cryptocurrency). Binance is considered one of the best options for crypto-to-crypto trading. It is the leading exchange by volume and has the most liquidity because of this. It lists a wide variety of projects and will also delist projects if it feels the need to. Binance provides a set of professional tools to assist the trader including an order book, depth chart, and price chart. The fees are also highly competitive for the exchange. 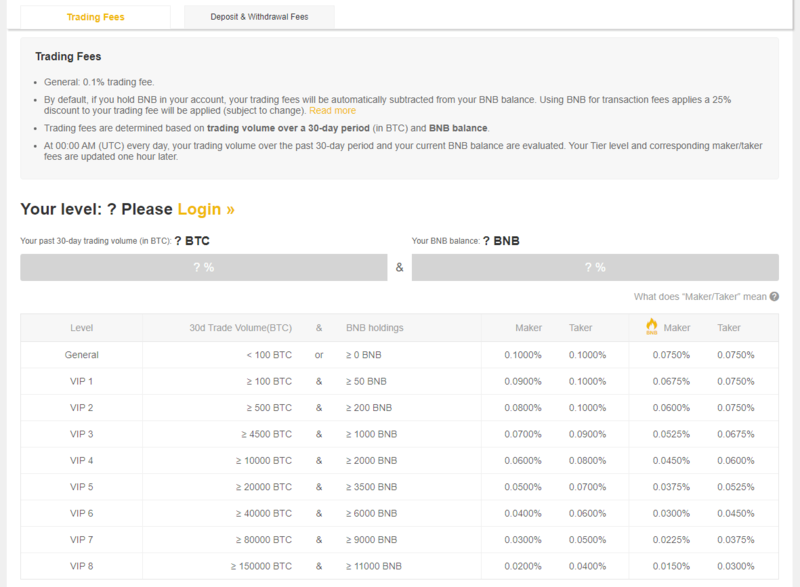 Users that hold amounts of Binance’s native cryptocurrency, BNB, avail of lower fees. BNB was distributed as part of Binance’s ICO in 2017. BNB can now be bought and sold on Binance. Fees are lower for market makers which are traders that place limit orders that provide much-needed liquidity. Market takers are traders which take the best price possible at a given time and take away liquidity. Binance does not operate in fiat currencies so the exchange is solely for crypto-to-crypto trading. This one of the key drawbacks of the exchange because users who wish to use the exchange but want to exchange their fiat currency for cryptocurrency will have to purchase cryptocurrency elsewhere and transfer it to Binance. Users of the exchange can speculate on the value of cryptocurrencies priced against USD by trading the pairs which are priced against USDT. Binance has mentioned plans to launch support for fiat currencies and have also opened a partnership exchange in Singapore with support for fiat currencies. Because Binance does not deal in fiat currencies, they remain largely unregulated. Binance has recently moved their headquarters to Malta to take action towards being more regulated. Malta is developing a regulatory framework for businesses operating in cryptocurrencies and it is likely that Binance will be compliant with these set of regulations. Bittrex was for a long time the main place where most traders conducted their altcoin trading. Prior to Binance and other exchanges developing a focus on a wide variety of altcoins, Bittrex had one of the largest crypto-to-crypto offerings. Bittrex has also recently added fiat currency support setting it up to compete with the likes of Coinbase and Kraken. Bittrex has markets that pair altcoins against USD, Bitcoin, and Ethereum. 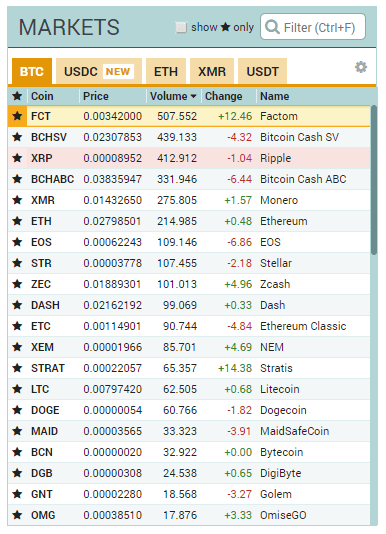 There are over 500 pairings for altcoins against Bitcoin. The tools provided include an order book, price chart, depth chart, and trades printing. All trades incur a 0.25% fee which is competitive. Bittrex is not regulated which adds some further risk to users funds. However, Bittrex has been successfully operating since 2014 and the executive team running the exchange are publicly known adding accountability. The main benefits to using Bittrex include the wide variety of altcoins available, the low trading fees, and the suite of trading tools provided. Poloniex is a crypto-to-crypto exchange which has been operating since 2014. It was acquired by Circle in February 2018. Poloniex is an exchange which some traders love and others traders hate. There are key benefits to it but there are also some key caveats. We will note both here and you can make up your own decision about whether to use this exchange. The fees for trading on Poloniex are competitive and progressively decrease based on the amount of volume being traded. Some of the key features Poloniex offers includes margin trading, the ability to open short positions, and lending. Margin enables traders to apply leverage to their position. It puts them in a position where their risk of loss is increased but also improves their returns if they speculate correctly. Fees will be charged on margin positions based on the market environment at the time. Opening a margin position involves the use of borrowed funds. The funds are borrowed from other users on the exchange and they specify the interest rate. It is possible for users of Poloniex to use their funds to lend to other traders and earn an interest rate. This is a feature which few exchanges offer. Margin trading also provides users with the option to take a short position. Few exchanges also offer this capability. Although having unique features, Poloniex also has its fair share of issues. There have been numerous problems with users withdrawing funds from the exchange. There have also been reports of support tickets being opened by users and ignored by the Poloniex team. Users of the exchange have to weight up both the features and the caveats. Although some have an issue withdrawing funds, users have also reported that exchanging to another cryptocurrency and then withdrawing can be a solution. One of the key benefits of Poloniex is having Circle as the company that owns it. Circle is backed by venture capital investors such as Goldman Sachs and it would tarnish both the company and the venture capital investors names if the exchange did not protect their user’s funds. Another exchange which offers margin trading is Kraken. Kraken support major fiat currencies such as EUR, USD, and GBP so that traders can speculate both long and short with their fiat currencies. 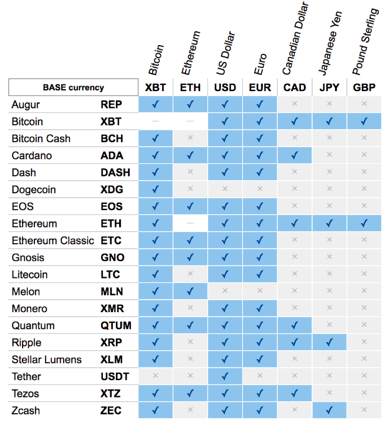 Most cryptocurrency exchanges which deal with fiat currency do not have a wide selection of altcoins supported. Kraken is an exception and supports a considerable amount of altcoin pairs which can be seen in the below table. This puts Kraken into a unique position. While there are ways to short altcoins through derivatives and margin, Kraken is an exchange where you can use your fiat currency to short altcoins. Users pay a fee for making a margin position but the fees are attractive. The standard maker and taker fees can be seen below. The fees get progressively lower based on the volume that is traded. There is a 0.01% to 0.02% fee applied for opening a position with margin and 0.01% to 0.02% is also charged every four hours depending on what product is being traded. This can add up if the user is taking a long position with margin but for intraday trading, these fees are very low. Kraken also provides a professional suite of tools which includes an order book, depth chart, recent trades printing, and price chart along with technical analysis tools. Kraken is also one of the more liquid exchanges. It is the world’s largest exchange in Euro Bitcoin trading. The company has also been operating since 2011 giving it a long history of operation and a reputation to protect. The key benefits of Kraken are the unique position it is in to provide the ability to go both long and short altcoins with fiat currency. Leveraged trading can also be applied with the margin capabilities. The liquidity of the exchange and suite of tools serve to add even more value to the user. The main drawback for Kraken in terms of altcoins is it does not offer the widest range of altcoins. While exchanges such as Bittrex offer over 500 pairs against Bitcoin, Kraken offers a wide variety for a fiat currency exchange but a small number when compared to the exchanges which especially deal in crypto-to-crypto trading. Cryptopia is a New Zealand based exchange. Cryptopia makes the list mainly due to its large amount of altcoins offered. Altcoins can often be found on Cryptopia which will not be listed on other exchanges. Cryptopia also has a competitive fee structure at 0.2% per trade. There are no deposit fees and withdrawal fees will vary. The exchange has been operating since 2014. Assets on the exchange are paired against Bitcoin, USDT, NZDT (a stablecoin pegged to the NZD), Doge, and Litecoin. Not many exchanges pair assets against NZDT, Doge, or Litecoin so this may be an attractive feature for some traders. 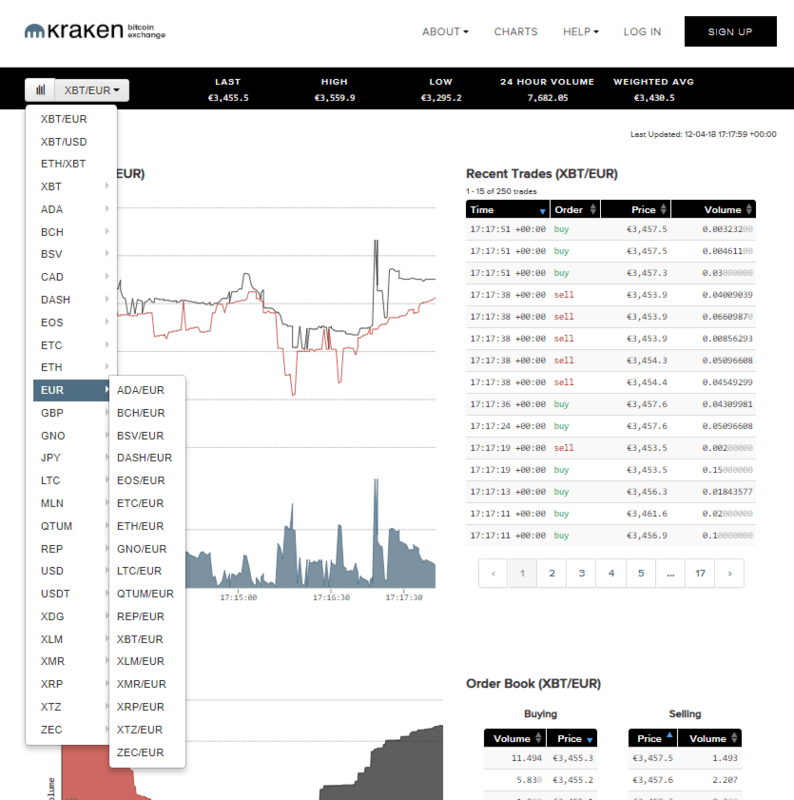 Trader tools include a price chart, order book, recent trades printing, and a distribution chart which shows the distribution of balances across the exchange. The distribution chart is another feature which is unique to Cryptopia. The main attraction to Cryptopia is being able to find altcoins which are not always listed elsewhere. The exchange supports over 750 altcoins which can be traded against Bitcoin. The trading fees are low as well which is another attractive point about this exchange. The key risk with using this exchange is it is one of the smaller and lesser known exchanges. This represents more of a risk if users decide to leave their funds on the exchange. Exchanges are the standard way that traders and investors swap between their cryptocurrencies. There are drawbacks to this process. If you hold your funds in a wallet, it can be costly to transfer them to an exchange, complete your trades, and transfer them back to the wallet. There are other options. Some services facilitate atomic swaps where altcoins can be directly swapped for one another. The process is simple. You input the address where you want to receive your desired cryptocurrency and you will be provided with an address to send the cryptocurrency which is being exchanged. We present in this bonus section the two leading atomic swap providers. Users are required to set up an account to start using Shapeshift. ShapeShift take security seriously and require that users both verify their email and enable two-factor authentication before using their service. Users will also be provided with codes they can use to recover their account in case access is lost. Once users set up their account and verify, they will be able to conduct trades to a limit of $10,000 daily. The transfer process is straightforward. Users select the cryptocurrency that they wish to transfer from and the cryptocurrency they wish to transfer to. They provide the address that they wish to receive the cryptocurrency to and they will be provided with an address to send the cryptocurrency being exchanged to. An exchange rate will be clearly stated and the miner fees will also be clearly shown. The exchange rate incorporates an approximate 0.5% fee for ShapeShift. Users can easily transfer from Bitcoin to altcoin, altcoin to Bitcoin, or altcoin to altcoin. ShapeShift currently supports 40 cryptocurrencies and aims to support more going forward. ShapeShift also have their own native token called FOX. Users with amounts of FOX will be able to access extra membership features going forward but these are not yet available. Users receive 100 FOX for verifying their account. Changelly operates in the very same way. Users can exchange Bitcoin to altcoin, altcoin to Bitcoin, or altcoin to altcoin. The account set-up is not as strict and users can exchange straight away once they have set-up their account. Miner fee will be clearly stated along with the exchange rate. Changelly charges the same fee as ShapeShift at 0.5% and this will be incorporated into their exchange rate. Changelly supports exchanging between over 100 cryptocurrencies. Users can avail of a daily limit up to $20,000 and a monthly limit up to $50,000. While Shapeshift only supports exchanging between cryptocurrency, Changelly also supports exchanging EUR and USD between cryptocurrencies. Users can purchase cryptocurrencies with debit or credit cards. Users have to undergo a verification to use this option and will also pay higher fees of 5% going to Changelly and 5% going to the payment processor. The transactions of fiat for cryptocurrency are fast taking approximately 10 to 30 minutes.